Did you pick up beets from the market this weekend? Are you going to make a raw or roasted beet dish? Whatever you do, don't discard the beet greens! They can be substituted for chard in recipes. 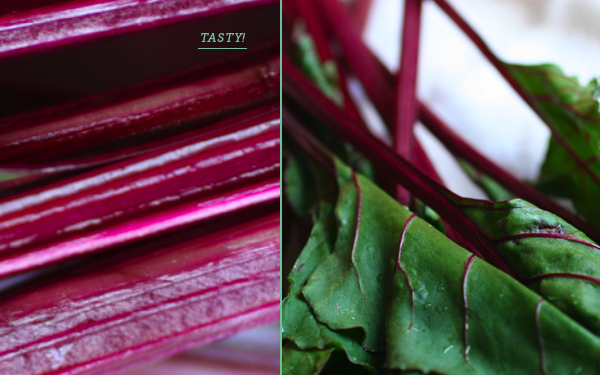 Seriously, beets and red-stemmed chard are related. They both share a wine-colored stem, which I think is pretty rad. That has to mean there's some extra vitamins and minerals in there, right? Right. 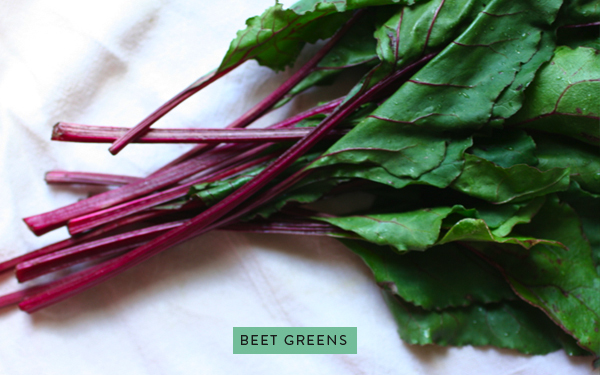 Beet greens are full of folic acid, vitamins K and A. They also contain more iron and calcium than just the beet itself. So next time, save those greens! I've been digging the humble beet green lately, and the CSA has kept my crisper full. I sauté them with spring onions and garlic, and finish with this tahini sauce (yes, I'm addicted). They sound good on pizza and in a risotto too. As you can see there's no Food Matters Project recipe here today, so skip on over to see what Laura and the rest of the members whipped up. Source: Woods, Rebecca. The Whole Foods Encyclopedia, 2010. I have been eating my beet greens and they are amazing. Stirred it in with fried rice and it was good! Do you have any tips for cleaning beet greens? Last time I bought beets I cleaned and sauteed the greens, but in spite of what I thought was a thorough cleaning they were still sandy. The greens tasted great, but the sand kind of ruined it for me! I love sautéed beet greens, but have never tried them with tahini. I better get on that stat! Have you had a chance to read 'An Everlasting Meal', your post on this reminded me of the book. Amanda, I let the greens soak for an hour or so in a bowl of water. Then I rinse 3-4 times in a large bowl before moving to a salad spinner to dry. If I notice any more dirt at the bottom of the spinner, I'll rinse again. It can be rather arduous, but the work pays off in the end! I always get in trouble because the red beet juice that comes from the beet's when you boil them get's all over the flour. Beet juice. Yum.